First Case Of New Bird Flu Found Outside China : Shots - Health News Concerns about the flu have intensified as the cases and fatalities mount. Transmission of the virus between birds and humans appears to happen fairly easily. It's unclear whether it can spread from one person to another. People sit near pigeons at a park in Shanghai where more than 30 human cases of bird flu have been reported. The Taiwanese Centers for Disease Control said a case of H7N9 avian influenza was confirmed in a 53-year-old man who worked in Suzhou, Jiangsu Province, China. He became ill three days after returning to Taiwan from China. 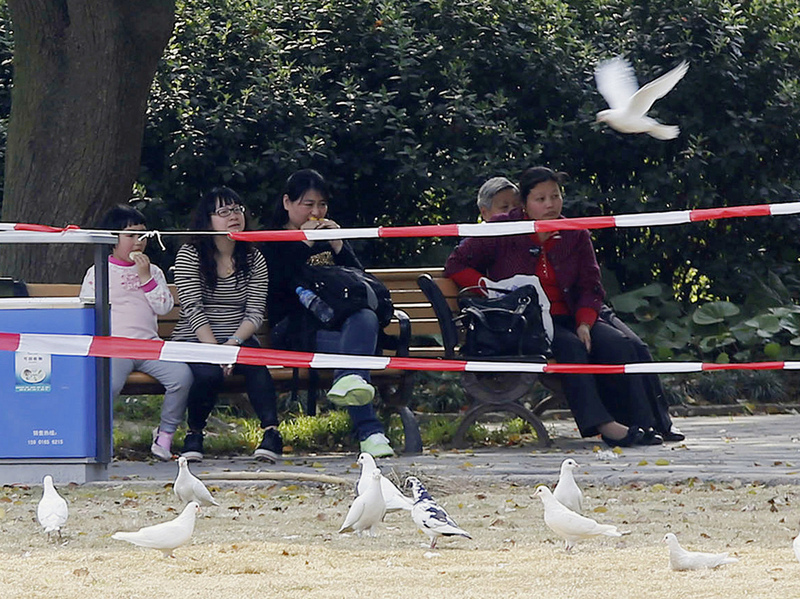 Lab tests confirmed Wednesday that he was infected with H7N9. "The patient is currently in a severe condition and being treated in a negative-pressure isolation room," the Taiwanese CDC said in a statement. The man didn't have contact with "birds and poultry during his stay in Suzhou," and he didn't eat undercooked egg or poultry either, the Taiwanese authorities said. Concerns about the flu have intensified as the cases and fatalities mount. "This is definitely one of the most lethal influenza viruses we have seen so far," Dr Keiji Fukuda, WHO's assistant director-general for health security, said at a media briefing in Beijing Wendesday, the Associated Press reported. Transmission of the virus between birds and humans appears to happen fairly easily. "We think this virus is more transmissible to humans than H5N1," Fukuda said. The H5N1 bird flu, a strain that sparked earlier worries, has been confirmed in 622 human cases and 371 deaths since 2003, WHO data show. As for the H7N9 variety, there isn't enough evidence to "conclude there is person to person transmission," Fukuda said in a statement. "We want to note that if limited person to person transmission is demonstrated in the future, it will not be surprising," he added. "Enhancing surveillance is the way to early detect such occurrence." One problem when it comes to tracking the virus is that it doesn't appear to cause visible illness in infected birds. It's also not clear how many people might have been infected with the virus without showing signs of illness. The WHO briefing came after a joint investigation by WHO and Chinese health authorities in Shanghai and Beijing over the past week. Fukuda called China's response to the flu outbreak "exemplary," citing its speed and openness. The closing of live poultry markets in Shanghai, for instance, appears to have helped. Human cases of the flu declined markedly afterward.